Small fruit flies get their name because of their fondness for fruits as breeding and development sites. They’re also called vinegar flies, sour flies, pomace flies, mop flies, etc. Newly emerged adults are attracted to lights. Adults tend to hover in small circles, while some species spend most of their time sitting on vertical surfaces. Because of their small size, they are able to penetrate ordinary window screens. A nuisance pest, but may be a health hazard as a carrier of pathogenic bacteria. Dull tan to brownish yellow or brownish black. Adults measure 1/8 of an inch (3-4 millimeters) long, including wings. Dull tan to brownish yellow or brownish black; eyes are bright red, but may be very dark red-brown. Overripe fresh fruits and vegetables, especially those fermenting, as well as decaying matter often found in poorly cleaned drains. Their enormous potential to reproduce is especially apparent when a location has an abundance of optimal areas for breeding. Even more troublesome, their short life span allows them to exploit temporarily available developmental sites, such as sour mop and broom heads, fruit under a table or counter, beer or wine residue, spilled cider and juices, etc. Dishwater and mop water loaded with food particles can also serve as an ideal breeding location, as well as damaged seals on dishwashers and imperfect floor tile grouting. Once laid, eggs hatch within 30 hours. The larvae spend the next five to six days developing and feeding primarily on yeast expelled from fermenting materials. The larvae will then move to drier areas for pupating. Once an adult, they will mate within two days, completing the adult life cycle within seven to 10 days, depending on temperature. 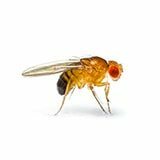 Small fruit flies are a challenge to eliminate because of how quickly and easily they can multiply.